Christmas traditions vary across the globe, there are differences in the food, the date of Christmas day, the number of Santa Clauses and much more. One of the traditions that change all over the world is the Christmas sweet. The English eat Christmas puddings, Americans often tuck into a pumpkin pie and the Australians eat pavlova. For the Italians, the traditional Christmas dessert is the panettone and there is deep history and several legends to digest with it! Festive celebrations in Italy provide a guarantee of panettone, much like the guarantee of Christmas pudding in England. The cake-like bread is citrusy and is the perfect accompaniment to a tea or a coffee. The mixture consists of yeast, flour, milk, eggs, vanilla, butter, cream and an assortment and generous helping of glace fruits. A traditional panettone should be cylindrical in shape, with a ballooning and domed top. The cake should be much taller than it is wide and the texture should be light and airy. Usually, the cake should be flavoured with fruit, but in more recent years, chocolate and nuts have been used instead. One of the many legends around panettone is related to Signor Ughetto degli Atellani. During the 1400’s, the young man fell helplessly in love with the daughter of a baker, Adalgisa. The parents of Ughetto forbade him to marry Adalgisa, but he came up with a fool proof plan which would allow him to see his lover again. He became a baker and took a job at the bakery of Adalgisa’s parents. 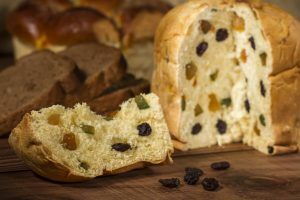 The bakery had been struggling to stay open and while Ughetto was working, close to Christmas, he trailed a fruity bread mix, which he named panettone. The cake-bread became so popular, that the bakery was saved and the couple were given permission to marry. Another legend says that Toni, who was a young kitchen helper at the court of Duke Ludovico during the 15th century, was the creator of the panettone. During the Christmas celebration, the head chef accidentally burnt the dessert, which ruined the sweet and meant it couldn’t be served. The Duke demanded a dessert and as the head chef became increasingly stressed under the pressure, the kitchen helper stepped in. Toni had made a sweet loaf, panettone, out of left-overs and he was planning on serving it to the servants as a Christmas treat. As the Duke was getting more and more frustrated, he suggested serving it in court, the head chef agreed and it was given to the Duke and his friends. It proved a huge success and the Duke loved the pudding and called downstairs for the chef to come up to court so he could be congratulated. As the chef was unable to take credit, Toni, the kitchen helper was sent to see the Duke and his guests. The third legend around panettone is that of Sister Ughetto. A nun in a monastery wanted to lift the spirits of her fellow sisters over the Christmas period. The legend tells the tale if Sister Ughetto baking a simple cake out of the left-over fruit and peel, before cooking, she cut the shape of a crucifix on the top. She served it to her fellow sisters, who very much appreciated the addition to their otherwise minimalist meal. In Italy, panettone is a very common and gladly accepted gift during the festive period. Traditionally, it is served with the baking paper removed and cut into triangle wedges. It is considered bad luck if the top dome is removed separately and it should never be eaten on your own. Will you be trying the traditional panettone during your stay in our Italian holiday villas? Do you know any other legends around the famous and celebrated panettone? Let us know via our social media channels.